Sarah E. Hardison, Gina Herrera, Mattie L. Young, Camaron R. Hole, Karen L. Wozniak and Floyd L. Wormley Jr. Experimental pulmonary Cryptococcus neoformans infection in BALB/c mice is associated with polarized Th2-type cytokine production, alternative macrophage activation, and severe bronchopneumonia. In contrast, pulmonary infection with a C. neoformans strain that secretes IFN-γ, H99γ, elicits Th1-type cytokine production and classical macrophage activation. Additionally, mice infected with H99γ resolve the acute infection and are subsequently protected against challenge with wild-type C. neoformans. The present study characterizes macrophage activation during the protective response to wild-type C. neoformans in mice previously immunized with H99γ. We observed increased pulmonary Th1-type cytokine production in lung homogenates and classical macrophage activation as evidenced by enhanced expression of inducible NO synthase in the lungs of H99γ-immunized mice compared with mice given a nonprotective immunization with heat-killed C. neoformans (HKCn). Furthermore, macrophages isolated from H99γ-immunized mice on day 7 postchallenge and cultured in vitro were fungistatic against C. neoformans, whereas cryptococcal growth was uncontrolled within macrophages from HKCn-immunized mice. Th2-type cytokine production and induction of alternatively activated macrophages were also observed in lungs of HKCn-immunized mice during rechallenge. Gene expression arrays showed that classical macrophage activation during challenge infection in H99γ-immunized mice was associated with induction of the transcription factor STAT1 and its downstream targets IFN regulatory factor-1, suppressor of cytokine signaling-1, CXCL9, and CXCL10. These studies demonstrate that protective responses to C. neoformans challenge in immunized mice include classical macrophage activation and enhanced macrophage fungistasis of C. neoformans yeasts. Finally, the classical activation phenotype of protective anticryptococcal macrophages is likely mediated via STAT1 signal transduction pathways. Cryptococcus neoformans, the predominant etiological agent of cryptococcosis, is an opportunistic fungal pathogen and frequent cause of life-threatening infection in individuals with suppressed cell-mediated immunity. Cryptococcosis is considered an AIDS-defining illness and the most common mycological agent of morbidity and mortality in AIDS patients (1). Infection is typically initiated by inhalation of desiccated basidiospores or yeast into lung alveoli, resulting in mild or asymptomatic infection in immune-competent individuals (2). Furthermore, C. neoformans has a predilection to disseminate to the CNS, causing life-threatening meningoencephalitis. Global estimates suggest that one million cases of cryptococcal meningitis occur each year, resulting in ∼ 620,000 deaths (1). As inhalation is the principal route of entry for C. neoformans, clearance from the lungs is largely dependent on the ability of phagocytes to ingest and degrade yeast cells, thereby preventing dissemination. Macrophages can be activated into phenotypically and functionally diverse effector cells, largely depending on the cytokine environment present during infection (reviewed in Refs. 3 and 4). Classically activated macrophages, also designated as M1, are induced in high–IFN-γ cytokine environments and are microbicidal and proinflammatory. Alternatively activated macrophages, also designated as M2, are induced by Th2-type cytokines (specifically, IL-4 and IL-13) and can produce a mixture of anti-inflammatory cytokines and repair molecules that mediate wound healing and extracellular matrix remodeling. In experimental models of C. neoformans infection, resistance to cryptococcosis is associated with the induction of Th1-type cytokine responses, increased lymphocyte infiltration, and classical macrophage activation (5–7). In contrast, nonprotective anticryptococcal responses are accompanied by Th2-type cytokine responses and alternative macrophage activation, resulting in uncontrolled fungal growth, dissemination, and exacerbation of disease (8, 9). Experimental pulmonary infection with C. neoformans strain H99 in BALB/c mice elicits Th2-type cytokines and alternative macrophage activation (6, 10). In contrast, pulmonary infection in BALB/c mice with a C. neoformans strain engineered to produce murine IFN-γ, designated H99γ, results in the induction of Th1-type cytokines and classical macrophage activation (6). Furthermore, mice that were previously infected with C. neoformans strain H99γ are completely protected against a subsequent pulmonary challenge with a fully pathogenic wild-type C. neoformans strain (11). The present studies evaluate macrophage activation during rechallenge with wild-type C. neoformans in immunized mice. We demonstrate that protective secondary responses involve the induction of macrophages that have increased fungistatic activity against C. neoformans. Also, the elicitation of the classical macrophage phenotype during C. neoformans challenge in protectively immunized mice occurs via a STAT1-mediated signal transduction pathway. Female BALB/c (H-2d) mice, 4–6 wk age (National Cancer Institute/Charles River Laboratories), were used throughout these studies. Mice were housed at The University of Texas at San Antonio Small Animal Laboratory Vivarium and handled according to guidelines approved by the Institutional Animal Care and Use Committee. C. neoformans strains H99 (serotype A, mating type α) and H99γ (derived from H99) (11) were recovered from 15% glycerol stocks stored at −80°C prior to use in the experiments described in this study. The strains were maintained on yeast extract/peptone/dextrose (YPD) medium agar plates (Becton Dickinson, Sparks, MD). Yeast cells were grown for 14–16 h at 30°C with shaking in liquid YPD broth, collected by centrifugation, washed three times with sterile PBS, and viable yeast was quantified using trypan blue dye exclusion on a hemacytometer. Pulmonary C. neoformans infections were initiated by nasal inhalation as previously described (11). Briefly, BALB/c mice were anesthetized with 2% isoflurane using a rodent anesthesia device (Eagle Eye Anesthesia, Jacksonville, FL) and then given a yeast inoculum of 1 × 104 CFU either C. neoformans strain H99γ or heat-killed C. neoformans (HKCn) strain H99 yeasts in 50 μl sterile PBS and allowed 35 d to resolve the infection. Subsequently, immunized mice received a second experimental pulmonary inoculation with 1 × 104 CFU wild-type C. neoformans strain H99 in 50 μl sterile PBS. The inocula used for nasal inhalation were verified by quantitative culture on YPD agar. Mice were euthanized on predetermined days following inoculation and lung tissues were excised using an aseptic technique, homogenized in 1 ml sterile PBS, and cultured by 1:10 dilutions on YPD agar supplemented with chloramphenicol (Mediatech, Herndon, VA). CFU were enumerated following incubation at 30°C for 48 h.
For immunofluorescence experiments, rabbit anti-mouse arginase-1 (Arg1; Santa Cruz Biotechnology, Santa Cruz, CA), rat anti-mouse CD206 (macrophage mannose receptor; AbD Serotec, Raleigh, NC), rat anti-mouse Ym1 (R&D Systems, Minneapolis, MN), rat anti-mouse F4/80 (AbD Serotec), and rabbit anti-mouse inducible NO synthase (iNOS; Axxora, San Diego, CA) were used. Primary Abs were detected using appropriate Alexa 488-conjugated goat anti-rat IgG or goat anti-rabbit IgG secondary Abs (Invitrogen, Carlsbad, CA). For Western blots, rabbit anti–phospho-STAT1 (Tyr701), rabbit anti-STAT1, and rabbit anti–β-actin (Cell Signaling Technology, Beverly, MA) primary Abs were used. Primary Abs were detected with goat anti-rabbit IgG Ab (Thermo Fisher Scientific, Rockford, IL). Cytokine production in lung tissues was analyzed using the Bio-Plex protein array system (Luminex-based technology; Bio-Rad Laboratories, Hercules, CA). Briefly, lung tissue was excised and homogenized in ice-cold sterile PBS (1 ml). An aliquot (50 μl) was taken to quantify the pulmonary fungal burden and an antiprotease buffer solution containing PBS, protease inhibitors (inhibiting cysteine, serine, and other metalloproteinases), and 0.05% Triton X-100 was added to the homogenate and then clarified by centrifugation (800 × g) for 5 min. Pulmonary homogenates were assayed undiluted for cytokine production. Mice were continuously sedated using 2% isoflurane, as previously stated. Lungs were perfused with sterile PBS by transcardial perfusion through the right ventricle. The pericardium and trachea were exposed by dissection, and an incision was made in the trachea for the insertion of a sterile flexible cannula attached to a 3-ml syringe. The lungs were then slowly inflated with 0.5–0.7 ml Tissue-Tek OCT compound (Sakura Finetek, Torrance, CA)/2 M sucrose (1:1 [v/v]) solution. The lungs were then excised and immediately preserved in cryomolds containing OCT medium on dry ice and stored at −80°C until use. Serial frozen tissue sections were cut at a thickness of 10 μm and fixed at −20°C in acetone for 10 min. Tissue sections were rehydrated in 70% ethanol for 5 min and washed in PBS for 3 min. Nonspecific binding was inhibited by incubating for 30 min at room temperature with serum from the same species from which the fluorochrome-conjugated Abs were derived (10% in PBS). Tissue sections were incubated overnight at 4°C with primary Abs diluted in species-specific serum (3% in PBS) at preoptimized concentrations. Subsequently, the sections were washed five times in Tris-NaCl-Tween 20 (TNT) buffer solution for 3 min each. Sections were then incubated with secondary Abs for 30 min at room temperature. Slides were washed five times in TNT buffer for 3 min each, one time in PBS containing 1% Triton X-100 to minimize background fluorescence (5 min) and a final wash in TNT buffer (3 min). Sections were then mounted with FluorSave reagent (Calbiochem, La Jolla, CA) containing 0.3 μM DAPI (Molecular Probes, Eugene, OR). Fluorescence was visualized with a Leica DMR epifluorescence microscope (Leica Microsystems, Wetzlar, Germany). Images were acquired using a cooled Spot RT charge-coupled device camera (Diagnostic Instruments, Sterling Heights, MI). Lungs were excised on days 1, 3, 7, and 14 after secondary inoculation or from immunized unchallenged mice and digested enzymatically at 37°C for 30 min in 10 ml digestion buffer (RPMI 1640 and 1 mg/ml collagenase type IV [Sigma-Aldrich, St. Louis, MO]) with intermittent (every 10 min) stomacher homogenizations. The digested tissues were then successively filtered through sterile 70- and 40-μm nylon filters (BD Biosciences, San Diego, CA) and washed with sterile HBSS. Erythrocytes were lysed by incubation in NH4Cl buffer (0.859% NH4Cl, 0.1% KHCO3, 0.0372% Na2EDTA [pH 7.4]; Sigma-Aldrich) for 3 min on ice followed by a 2-fold dilution with PBS. The resulting leukocyte population was then enriched for macrophages by positive selection using magnetic beads labeled with CD11b Ab (Miltenyi Biotec, Auburn, CA) according to the manufacturer’s recommendations. Total RNA was isolated from purified CD11b+ cells using TRIzol reagent (Invitrogen) and then DNase (Qiagen) treated to remove possible traces of contaminating DNA according to the manufacturer’s instructions. Total RNA was subsequently recovered using the Qiagen RNeasy kit. cDNA was synthesized from 1 μg total RNA using the oligo(dT) primer and reagents supplied in the SuperScript III RT kit (Invitrogen) according to the manufacturer’s instructions. The cDNA was used as a template for real-time PCR analysis using the TaqMan gene expression assay (Applied Biosystems, Foster City, CA) according to the manufacturer’s instructions. All real-time PCR reactions were performed using the 7300 real-time PCR system (Applied Biosystems). For each real-time PCR reaction, a master mix was prepared on ice with TaqMan gene expression assays specific for iNOS, IFN-γ, IL-17, Ym1, FIZZ1, Arg1, IL-4, IL-13, and CD206 (Applied Biosystems). TaqMan rodent GAPDH (Applied Biosystems) was used as an internal control. The thermal cycling parameters contained an initial denaturing cycle of 95°C for 10 min followed by 40 cycles of 95°C for 15 s and 60°C for 60 s. Results of the real-time PCR data were derived using the comparative Ct method to detect relative gene expression. For the pathway arrays, RNA was isolated from CD11b+ cells as described above, reverse transcribed according to the manufacturer’s instructions (Qiagen), and amplified using the reagents provided by SABiosciences (Frederick, MD) RT2 Profiler PCR array kits (PAMM-018 and PAMM-039). Results were analyzed using the comparative Ct method and statistical software provided by SABiosciences. The data are deposited in the National Center for Biotechnology Information’s Gene Expression Omnibus (GEO) and are accessible through GEO Series accession no. GSE39990 (available at: http://www.ncbi.nlm.nih.gov/geo/query/acc.cgi?acc). Cell viability and quantity of CD11b+-enriched macrophage populations were assessed using trypan blue exclusion in a hemacytometer. Macrophages were then cultured at a density of 1 × 105 or 5 × 105 cells per well in a 96-well tissue culture plate in RPMI 1640 supplemented with 10% FBS, 2 mM l-glutamine, and 100 μg/ml penicillin-streptomycin. Different numbers of macrophages were used owing to the low numbers of macrophages able to be recovered from mice. Macrophages were incubated at 37°C and 5% CO2 for 24 h in triplicate wells. Initial fungal burden was determined by lysis of the macrophages using sterile deionized water followed by serial dilution and plating on YPD agar supplemented with chloramphenicol (Mediatech) for 48 h at 30°C. After 24 h in culture, cell culture supernatants were collected and an aliquot (50 μl) was used to determine NO production using Griess reagent (Sigma-Aldrich) according to the manufacturer’s instructions. Light absorbance values were measured at 540 nm using a BioTek Elx808 absorbance microplate reader with Gen5 v1.04.5 software (BioTek Instruments, Winooski, VT). Cryptococci were subsequently liberated from within macrophages using sterile deionized H2O (100 μl). CFU were enumerated following incubation of 1:10 dilutions at 30°C for 48 h on YPD agar supplemented with chloramphenicol (Mediatech). CD11b+ cells were enriched from pulmonary digests, washed twice in sterile PBS, and resuspended in RIPA lysis buffer (Sigma-Aldrich) containing Halt protease and phosphatase inhibitor (Thermo Fisher Scientific). Lysates were sonicated for 30 s, incubated on ice for 30 min, and then clarified by centrifugation and stored at −80°C until use. Protein concentration was determined using the RC DC protein assay kit (Bio-Rad), and total protein (20 μg) was suspended in Laemmli buffer (Bio-Rad) and subjected to SDS-PAGE in 10% polyacrylamide TGX gels (Bio-Rad). Proteins were blotted to a polyvinylidene difluoride membrane and nonspecific binding was blocked with 3% BSA in TBS containing 0.5% Tween-20 (TBST). The membranes were incubated overnight at 4°C with a 1:1000 dilution of rabbit antiphosphorylated protein primary Abs in TBST containing 1% BSA. Blots were then washed three times in TBST and Ab binding was detected by the addition of goat anti-rabbit IgG HRP-conjugated Ab (Pierce Biotechnology, Rockford, IL) diluted 1:3000 in TBST for 1 h at room temperature. The membranes were incubated for 5 min with Pierce ECL (Thermo Fisher Scientific) and exposed to x-ray film. Blots were stripped using Restore Western blot stripping buffer (Thermo Fisher Scientific) according to the manufacturer’s instructions and then probed again for total STAT1 (1:1000) and subsequently β-actin (1:1000). The unpaired Student t test (two-tailed) using GraphPad Prism version 5.00 for Windows (GraphPad Software, San Diego, CA) was used to detect statistically significant differences, defined as p < 0.05. Previous studies in our laboratory have demonstrated that acute pulmonary infection with an IFN-γ–secreting strain of C. neoformans, denoted H99γ, results in Th1-type cytokine production, classical macrophage activation, and clearance of cryptococci in BALB/c mice (6, 11, 12). These findings are in contrast with the Th2-type polarization, alternative macrophage activation, and mortality observed in BALB/c mice following pulmonary infection with wild-type C. neoformans. Immunization with C. neoformans strain H99γ elicits complete protection against subsequent challenge with a fully virulent non–IFN-γ-producing C. neoformans strain, but the phenotype of the macrophage response during challenge infection in immunized mice remains undefined. To determine the macrophage activation phenotype, BALB/c mice were given an intranasal immunization with C. neoformans strain H99γ or HKCn and allowed 35 d to resolve the infection. BALB/c mice completely resolve infection with C. neoformans strain H99γ prior to day 35 (6). Immunized animals were then challenged with wild-type C. neoformans strain H99 and pulmonary fungal burden was quantified on days 3, 7, and 14 after secondary inoculation. 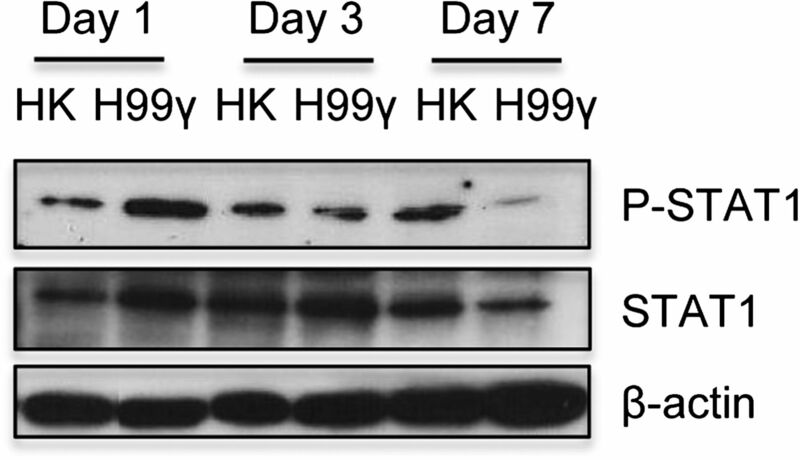 We observed progressive growth of C. neoformans strain H99 in the lungs of mice immunized with HKCn (Fig. 1A). In contrast, mice immunized with C. neoformans strain H99γ showed significantly reduced pulmonary fungal burden on days 7 and 14 after secondary inoculation (p < 0.05) compared with mice immunized with HKCn (Fig. 1A). No viable cryptococci were detected following culture of whole lung homogenates derived from H99γ-immunized mice on day 21 after secondary inoculation (data not shown). For the purpose of clarity, we hereafter refer to mice immunized with C. neoformans strain H99γ or HKCn yeast as protected and nonprotected mice, respectively. Th1-type cytokine production is elicited in the lungs of C. neoformans strain H99γ-immunized mice upon rechallenge with wild-type C. neoformans. BALB/c mice received an intranasal inoculum of 1 × 104 CFU C. neoformans strain H99γ or HKCn in 50 μl sterile PBS. Thirty-five days later, mice received an intranasal inoculation with 1 × 104 CFU C. neoformans strain H99. The lungs of each group of mice were excised at days 3, 7, and 14 after secondary inoculation and fungal burden was quantified (A) or cytokine production measured (B–D) in pulmonary homogenates. Fungal burden data are representative of three separate studies with five mice per group. Cytokine data are cumulative of three experiments using five mice per group. Fungal burden results are expressed as means ± SEM log10 CFU per milliliter of lung homogenate. *p < 0.05, mice immunized with C. neoformans strain H99γ compared with HKCn-immunized mice (data are reported as means ± SEM). Polarized Th1-type and Th2-type cytokine environments induce differentiation of macrophages into classical or alternative, respectively, activation phenotypes (6–8, 13). Thus, we evaluated Th2-type (IL-4, IL-5, and IL-13), Th1-type (IL-2, IL-12, and IFN-γ), and IL-17A cytokine production in total lung homogenates derived from protected and nonprotected mice following challenge with wild-type C. neoformans strain H99 on days 3, 7, and 14 after secondary inoculation. We observed a significant increase in the Th1-type cytokines IL-2, IL-12, and also IL-17A (Fig. 1B) on days 3 and 7 after secondary inoculation in lungs from protected mice compared with pulmonary cytokine levels in nonprotected mice. In contrast, we observed a significant increase in the Th2-type cytokines IL-4 and IL-5 (Fig. 1C) on days 7 and 14 and IL-13 on day 14 after secondary inoculation in the lungs of nonprotected mice. Minimal IL-4 and IL-5 production was observed in the lungs of protected mice following rechallenge with C. neoformans strain H99 (Fig. 1C). Interestingly, very low levels of IFN-γ were detected overall in the lungs of protected mice and significantly more IFN-γ was detected in nonprotected lungs on day 14 after secondary challenge (Fig. 1D). The difference in IFN-γ levels at day 14 postinfection is likely due to the ongoing infection in nonprotected mice, whereas protected mice are nearly cleared of infection at that time point. Furthermore, another proinflammatory cytokine, TNF-α, previously implicated in protective immune responses against C. neoformans was not significantly different between protected and nonprotected mice at any time point examined (data not shown). Protection against C. neoformans infections is associated with the development of Th1-type immune responses and classical macrophage activation (7, 8). We previously demonstrated that classically activated macrophages are elicited in response to immunization with H99γ (6). In this study we sought to determine whether classical macrophage activation is induced following challenge with wild-type C. neoformans strain H99 in protected mice. Lungs were excised from protected and nonprotected mice on days 3, 7, and 14 after secondary inoculation with C. neoformans strain H99 and evaluated for hallmark markers of alternative and classical macrophage activation by immunohistological examination. Tissue sections were immunofluorescently labeled for F4/80+ cells (macrophages) or markers of classical (iNOS) and alternative (Arg1, CD206, and Ym1) macrophage activation. We observed an increase in F4/80+ infiltrates into the lungs of protected mice as early as day 3 following cryptococcal challenge that began to dissipate by day 14 as the infection was resolved (Fig. 2A). The expression of iNOS, the hallmark marker for classical macrophage activation, is also evident in the lungs of protected mice at days 3 and 7 after secondary challenge, but it is minimally expressed at day 14 (Fig. 2B). In nonprotected mice, macrophage infiltration is not evident by immunofluorescence staining of F4/80+ cells until day 7 after secondary challenge, and macrophages accumulate through day 14 (Fig. 2A). The alternative activation hallmark proteins Arg1, CD206, and Ym1 were expressed at low levels on days 3 and 7 postinoculation in tissues derived from protected and nonprotected mice (Fig. 2C, 2D, and 2E for Arg1, CD206, and Ym1, respectively). However, their expression increased significantly in the lungs of nonprotected mice on day 14 after secondary inoculation (Fig. 2C, 2D, and 2E for Arg1, CD206, and Ym1, respectively). In contrast, lungs from protected mice showed modest expression of alternative activation markers on each day observed. Thus, a second pulmonary infection with wild-type C. neoformans in nonprotected mice resulted in the progressive induction of alternative activation that was not observed in protected mice challenged with C. neoformans strain H99. Furthermore, experimental pulmonary infection with C. neoformans strain H99 in protected mice resulted in the promotion of iNOS expression, a hallmark of classical macrophage activation. Macrophages within the lungs of H99γ-immunized mice responding to a secondary cryptococcal challenge display a classical activation phenotype. BALB/c mice received an intranasal inoculum of 1 × 104 CFU C. neoformans strain H99γ or HKCn in 50 μl sterile PBS. Thirty-five days later, mice were intranasally infected with 1 × 104 CFU C. neoformans strain H99. Lungs were excised on days 3, 7, and 14 postinoculation and immediately frozen in OCT medium. Lungs were subsequently cryosectioned and F4/80 (A), iNOS (B), Arg1 (C), CD206 (D), and Ym1 (E) expressions were evaluated using immunofluorescence staining. Nuclei were counterstained with DAPI. Data shown are representative lung sections from three independent experiments (three mice per group and per experiment). Digital photographs show representative areas of lungs. Original magnification ×20. Next we quantified relative mRNA expression levels of genes associated with classical or alternative macrophage activation in pulmonary macrophage-enriched cell populations obtained from protected and nonprotected mice rechallenged with C. neoformans. 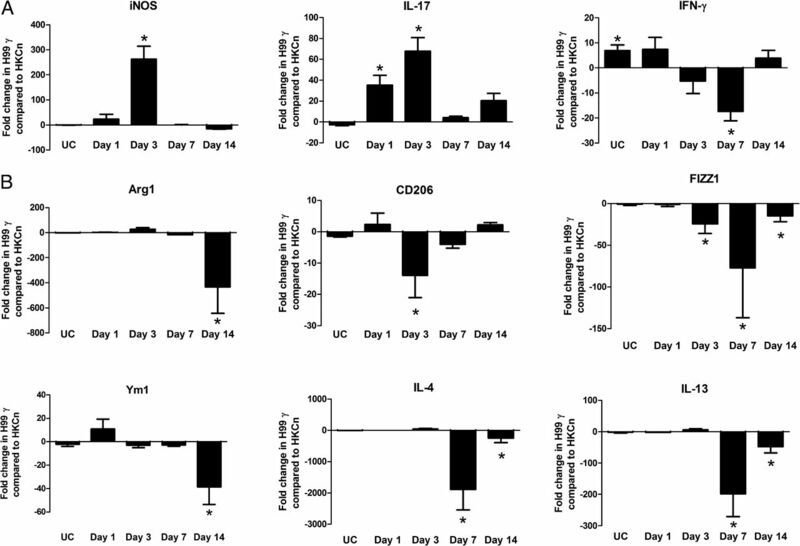 Leukocytes were isolated from enzymatic lung digests of protected and nonprotected mice at days 1, 3, 7, and 14 after secondary inoculation with C. neoformans strain H99 and from unchallenged immunized mice. We enriched for CD11b+ cell populations and performed real-time PCR for macrophage activation markers from total RNA. We observed significantly increased transcript levels of iNOS and IL-17 on day 3 after secondary inoculation in protected mice compared with nonprotected mice (Fig. 3A). In contrast, gene expression was significantly increased on day 14 for Arg1, on day 3 for CD206, on days 3, 7, and 14 for FIZZ1, on day 14 for Ym1, and on days 7 and 14 for IL-4 and IL-13 in nonprotected compared with protected mice following challenge (Fig. 3B). Interestingly, IFN-γ mRNA expression was significantly increased in macrophage-enriched cells obtained from protected compared with nonprotected mice prior to challenge with wild-type C. neoformans (Fig. 3A). However, IFN-γ mRNA expression was significantly decreased in protected mice on day 3 after secondary challenge compared with nonprotected, challenged mice (Fig. 3A). No other differences in the mRNA expression were observed in macrophages isolated from unchallenged protectively immunized mice compared with unchallenged nonprotectively immunized mice. Taken together, these findings demonstrate that pulmonary macrophages from nonprotected mice are alternatively activated during rechallenge with C. neoformans strain H99, whereas macrophages from mice that received a protective immunization with C. neoformans H99γ are classically activated. Real-time PCR analysis of macrophage-enriched populations show enhanced expression of transcripts indicative of classical macrophage activation during infection in H99γ-immunized mice. BALB/c mice received an intranasal inoculum of 1 × 104 CFU C. neoformans strain H99γ or HKCn in 50 μl sterile PBS. Mice were subsequently infected with 1 × 104 CFU C. neoformans strain H99 by intranasal inhalation or not challenged (UC). Pulmonary leukocytes were isolated from lung tissues by enzymatic digestion on days 1, 3, 7, and 14 postinoculation and macrophages were enriched for by positive selection of CD11b+ cells. Real-time PCR analyses of total mRNA from macrophage-enriched populations were conducted for iNOS, IL-17, and IFN-γ (A) and for Arg1, CD206, FIZZ1, Ym1, IL-4, and IL-13 (B). Bars represent the fold change in gene expression in macrophages from H99γ-immunized mice compared with nonprotected mice. Data shown are cumulative of three independent experiments utilizing pooled leukocytes of five mice per group per experiment and are reported as means ± SEM. *p < 0.05. To assess the fungistatic activity of macrophages responding to C. neoformans rechallenge in protected mice, we cultured primary macrophages isolated from the lungs of protected and nonprotected mice on days 3 and 7 after secondary inoculation with C. neoformans strain H99 for 24 h. We did not add additional cryptococci to cultures, as the macrophages were obtained from actively infected lungs and already contained live cryptococci, as previously noted (10). CFU within macrophages were determined at the time of culture (0 h) and again after 24 h. NO production was measured in cell culture supernatants after 24 h in culture. We observed no significant difference in the number of cryptococci found within macrophages obtained from protected compared with nonprotected mice at day 3 (Fig. 4A). Also, the quantity of yeast recovered from macrophages obtained from protected and nonprotected mice after 24 h in culture was similarly significantly increased compared with the initial number of intracellular cryptococci obtained from each group (Fig. 4A). Nevertheless, we measured significantly more NO at day 3 in culture supernatant of macrophages derived from protected mice compared with culture supernatant of macrophages obtained from nonprotected mice after 24 h in culture (Fig. 4B). The addition of recombinant IFN-γ to separate macrophage cultures had no impact on fungicidal activity or NO production observed in each group (data not shown). In contrast, at 7 d after secondary challenge macrophages from protected mice contained significantly less cryptococci than did macrophages from nonprotected mice (p < 0.05, Fig. 4A). The number of fungi recovered from macrophages obtained from nonprotected mice after 24 h in culture was significantly increased compared with the initial number of intracellular cryptococci. In contrast, the number of yeast recovered from macrophages from protected mice after culture for 24 h was not significantly different from the initial fungal count (Fig. 4A). A significantly higher amount of NO was measured in culture supernatants from macrophages obtained from protected mice compared with macrophages obtained from nonprotected mice after 24 h in culture (Fig. 4B); however, the “biological” impact of this result considering the overall low amounts of NO observed in each case remains to be determined. Macrophages derived from H99γ-immunized during secondary challenge mice are fungistatic and produce more NO. BALB/c mice received an intranasal inoculum of 1 × 104 CFU C. neoformans strain H99γ or HKCn in 50 μl sterile PBS. Mice were subsequently infected with 1 × 104 CFU C. neoformans strain H99. Pulmonary leukocytes were isolated from lung tissues on days 3 and 7 postinoculation and macrophages enriched by positive selection of CD11b+ cells. Macrophages were lysed and plated on YPD agar for CFU determination (0 h). Additionally, macrophages were cultured in complete medium for 24 h, lysed, and subsequently plated on YPD agar for CFU determination (A). Culture supernatants were also used to determine NO production using the Griess reagent (B). Data are cumulative of three experiments utilizing three mice per group (*p < 0.05, **p < 0.01, ***p < 0.001) and are reported as means ± SEM. We next sought to determine the signal transduction pathways that mediate classical macrophage activation in protected mice during cryptococcal rechallenge. To do this, leukocytes were isolated from enzymatically dispersed lungs of protected and nonprotected mice at days 1, 3, and 7 after secondary inoculation with wild-type C. neoformans. Total RNA was then prepared from macrophage-enriched cell populations and transcript expression was evaluated using commercially available JAK/STAT and TLR gene expression arrays (SABiosciences). We also evaluated transcript expression of macrophages derived from protected and nonprotected immunized mice taken prior to challenge using the JAK/STAT and TLR gene expression arrays as a control. However, the expression of most of the genes tested was below the limit of detection, and no other significant different differences between groups were observed with the exception of the difference in IFN-γ previously noted (Fig. 3 and data not shown). We observed a significant increase in STAT1 mRNA expression in macrophage-enriched cells obtained from protected, compared with nonprotected, mice on days 1 and 3 after secondary challenge (Fig. 5A). No significant difference in the expression of other STAT transcripts (STATs 2, 3, 4, 5, and 6) was observed between protected and nonprotected mice following rechallenge (data not shown). Furthermore, no transcripts for TLR or TLR-associated signaling molecules were significantly changed (data not shown). However, we observed a significant upregulation of several mRNA transcripts that are induced by STAT1 (Fig. 5). Specifically, we observed a significant increase in expression of IFN regulatory factor (IRF)-1, CXCL9, CXCL10, and suppressor of cytokine signaling (SOCS)1 transcripts on days 1 and 3 after secondary challenge in protected mice compared with nonprotected mice (Fig. 5A). The mRNA expression of SOCS3 in macrophages of protected mice was higher in protected mice on days 1 and 3 after secondary challenge, although the difference did not reach statistical significance (Fig. 5A). SOCS proteins are important for negatively regulating IFN signaling pathways, thereby preventing overexuberant inflammatory responses (14–16). STAT1 is phosphorylated by JAK1 or JAK2 bound to the IFN-γR and then it homodimerizes and translocates to the nucleus, where it binds a consensus γ-activated sequence and activates transcription (reviewed in Ref. 17). In our model, we observed an inhibition IFN-γR gene expression in classically activated macrophages and no statistically significant changes in JAK1 or JAK2 gene expression (Fig. 5B). These observations may be a reflection of the activity of the SOCS proteins, and they demonstrate the importance of tightly regulating IFN-γ signaling and proinflammatory responses during infection. STAT1 signaling cascade is upregulated in macrophages from infected H99γ-immunized mice. BALB/c mice were intranasally immunized with 1 × 104 CFU C. neoformans strain H99γ or HKCn in 50 μl sterile PBS. Thirty-five days later, mice were subsequently infected with1 × 104 CFU C. neoformans strain H99. Pulmonary leukocytes were isolated from lung tissues by enzymatic digestion on days 1, 3, and 7 postinoculation and macrophages were enriched for by positive selection using CD11b+ magnetic beads. Real-time PCR arrays of total mRNA from macrophage-enriched populations were conducted. 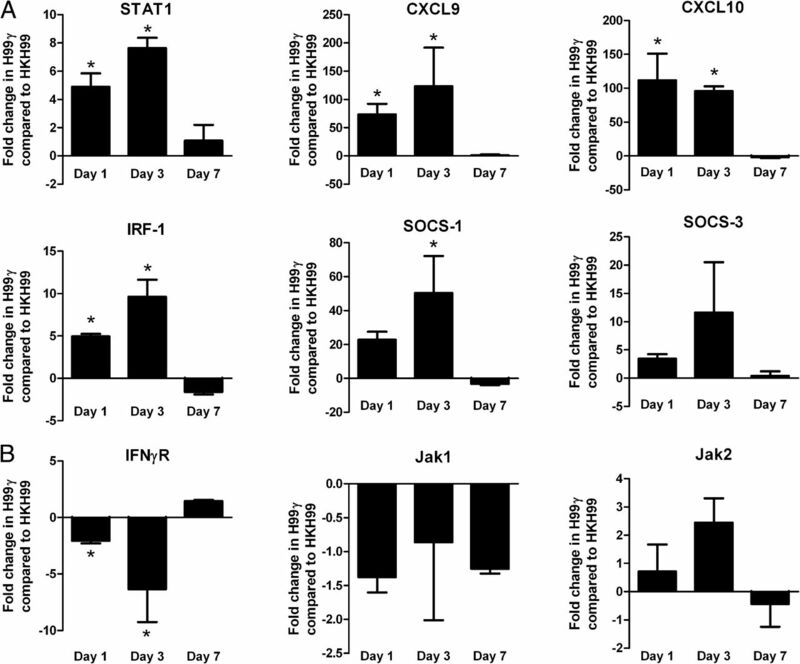 STAT1, CXCL9, CXCL10, IRF-1, SOCS-1, and SOCS-3 (A) are downstream of the IFN-γR, Jak1, and Jak2 (B). Bars represent the fold change in gene expression in macrophages from H99γ-immunized mice compared with nonprotected mice. Data shown are cumulative of three independent experiments utilizing pooled leukocytes of five mice per group per experiment and are reported as means ± SEM. *p < 0.05. HK, Heat-killed. To confirm that the increase in STAT1 transcript observed in macrophages from immunized mice correlates with protein expression, we performed Western blot analysis for total and phosphorylated STAT1 proteins (Fig. 6). STAT1 phosphorylation and total STAT protein were elevated in macrophages from protected mice compared with nonprotected mice at day 1 after challenge infection. By day 7 after challenge, STAT1 was minimally phosphorylated in protected mice, although there was little change in the amount of total STAT1 protein (Fig. 6). STAT1 phosphorylation in nonprotected mice remained constant through days 1 and 3 after secondary infection with a slight increase at day 7, whereas total STAT1 protein expression did not change (Fig. 6). No differences in STAT1 phosphorylation were detected in macrophages derived from protected and nonprotected immunized mice isolated prior to challenge (data not shown). STAT1 phosphorylation is increased in macrophages from H99γ-immunized mice during cryptococcal rechallenge. BALB/c mice were intranasally immunized with 1 × 104 CFU C. neoformans strain H99γ or HKCn in 50 μl sterile PBS. Thirty-five days later, mice were intranasally infected with 1 × 104 CFU C. neoformans strain H99. The lungs from each group of mice were excised on days 1, 3, and 7 postinoculation, and pulmonary leukocytes were isolated from lung tissues by enzymatic digestion and macrophages were enriched for by positive selection using CD11b+ magnetic beads. Total protein was extracted from cell lysates, resolved by SDS-PAGE, and blotted onto a polyvinylidene difluoride membrane. Blots were probed with an mAb against phosphorylated STAT1, then sequentially stripped and reprobed for total STAT1 and β-actin proteins. Data shown are representative of three independent experiments utilizing pooled leukocytes of five mice per group per experiment. HK, Heat-killed. Previous work in our laboratory has demonstrated that mice given an intranasal immunization with C. neoformans strain H99γ are protected against subsequent pulmonary infection with the wild-type C. neoformans strain H99 (6, 11, 12). In the present study, we characterized the activation phenotype of macrophages in immunized mice following pulmonary infection with the wild-type C. neoformans strain H99. Whereas pulmonary H99 infection in BALB/c mice is typically accompanied by nonprotective Th2-type cytokine responses and alternatively activated macrophages, we found that infection in H99γ-immunized BALB/c mice resulted in augmented Th1-type cytokine responses, induction of classically activated macrophages expressing iNOS, and rapid resolution of infection. Furthermore, these studies indicate that classically activated macrophages are more fungistatic against cryptococci, and they may play an important role in protective anticryptococcal responses. Arora et al. (8) demonstrated that experimental pulmonary C. neoformans infection in IFN-γ knockout (KO) mice resulted in significantly greater macrophage recruitment compared with wild-type mice. However, the infected IFN-γ KO mice displayed Th2-type polarized responses, alternative macrophage differentiation, and reduced fungistasis, leading to progressive cryptococcal infection. Augmented macrophage recruitment during experimental pulmonary C. neoformans infection is therefore alone not sufficient for clearance of the pathogen. Indeed, the induction of classically activated macrophages in an IL-4/IL-13 KO mouse model of pulmonary cryptococcosis was associated with improved control of fungal burden and overall improved lung pathology, although the animals ultimately succumbed to infection (7). Given that pulmonary challenge with C. neoformans strain H99 in H99γ-immunized mice results in the production of Th1-type cytokines in the lung that are conducive to classical activation (12), we hypothesized that classically activated macrophages are also induced during pulmonary challenge in protectively immunized mice. In the present study, mice protectively immunized with C. neoformans strain H99γ developed a polarized macrophage activation phenotype during challenge infection that was different from mice nonprotectively immunized with HKCn. A robust, progressive increase in hallmark markers of alternative activation (namely Arg1, CD206, FIZZ1, and Ym1) was observed during infection in nonprotected mice, but these markers were repressed in H99γ-immunized mice. FIZZ1 expression is enhanced in alveolar epithelial and type II cells during allergic pulmonary inflammation, and Ym1 crystallizes in alveolar spaces and in hyperactive lung macrophages (18–22). Arg1 competes with iNOS for its substrate, arginine, thus depleting the cell of NO, an important intracellular fungicide. Upregulated CD206 (mannose receptor) expression increases the phagocytic activity of macrophages in vitro, but it is accompanied by decreased microbicidal potential (23–26). Although we observed abrogated alternative macrophage differentiation during infection in protected mice, we also found increased iNOS expression, an important marker of classically activated macrophages. An increase in iNOS expression results in improved fungicidal activity owing to the generation of reactive oxygen and nitrogen species (27–30). Indeed, we were able to demonstrate enhanced fungistasis and NO production by macrophages obtained from protectively immunized mice and cultured ex vivo compared with macrophages derived from nonprotectively immunized mice during secondary C. neoformans challenge. Polarized cytokine environments are the most influential determinants of macrophage activation phenotype (3). Recent studies have shown that the proliferation of C. neoformans within macrophages is significantly lower following treatment with IFN-γ and IL-17 compared with IL-4 and IL-13 (31). In our studies, nonprotected mice challenged with C. neoformans developed a predominantly Th2-type pulmonary cytokine environment consisting of IL-4, IL-5, and IL-13; conversely, pulmonary infection in H99γ-immunized mice resulted in a Th1-type and IL-17 cytokine environment consisting of IL-2, IL-12, and IL-17. Thus, the overall cytokine milieu generated in the lungs of H99γ-immunized mice promotes the classical phenotype, whereas the pulmonary cytokine environment in nonprotected mice favors alternatively activated macrophages. Although we were able to induce a Th1-type and IL-17–polarized environment in H99γ-immunized mice during wild-type cryptococcal infection, the production of IFN-γ was not significantly different compared with nonprotected mice. We did observe increases in IFN-γ transcripts in macrophages derived from protectively immunized mice, compared with nonprotectively immunized mice, prior to secondary challenge, which may be suggestive of a “heightened” inflammatory state or added propensity for these cells to assume a classically activated phenotype. Although no other transcripts tested were elevated in macrophages from protectively immunized mice prior to rechallenge, our gene expression array data suggest that IFN-γR–mediated pathways are primarily responsible for the classical activation phenotype. We saw a significant upregulation in STAT1 gene expression, protein expression, and protein phosphorylation as early as 24 h after secondary challenge in H99γ-immunized mice. No other STAT molecules were significantly increased. STAT1 homodimers are activated via IFN-γR signal transduction and are transcription factors that initiate the transcription of genes whose promoters contain a consensus γ-activated sequence. STAT1-regulated genes include iNOS, IRF-1, CXCL9, and CXCL10 (17, 32–34), genes that we found significantly increased in macrophages derived from protected mice. CXCL9 and CXCL10 are chemokines that recruit leukocytes and monocytes to the site of infection. IRF-1 is a transcription factor that can regulate the expression of SOCS1 and SOCS3. SOCS1 and SOCS3 proteins create a negative feedback loop by blocking the downstream activation of the STAT1 pathway at the level of phosphorylation (14–16). Thus, it is interesting that IFN-γ is not significantly increased in protected mice, whereas IFN-γ pathways appear to regulate protection. It has been demonstrated that a protective monoclonal IgG1 Ab against C. neoformans polysaccharide capsule results in increased survival and reduced fungal burden during pulmonary cryptococcosis (35, 36). Interestingly, its administration significantly reduces IFN-γ levels during infection (36). Suppression of IFN-γ likely protects the host from deleterious overinflammation and associated tissue damage; however, IFN-γ cytokine production is crucial for the initiation of protective anticryptococcal immunity in mice, as IFN-γ and IFN-γR KO mice suffer exacerbated cryptococcal disease (8, 12, 37). Our data agree with these observations and suggest that early, rapid IFN-γ activation is required for the development of protective anticryptococcal immune responses, but that dampening of IFN-γ signaling is likely to be as important as its initiation. Indeed, the early dampening of IFN-γR expression and increased expression of SOCS1 and SOCS3 suggest early mechanisms for preventing an overexuberant inflammatory response. Collectively, the results show that pulmonary infection with C. neoformans strain H99γ in mice results in the induction of Th1-type and IL-17 cytokine responses, classically activated macrophages, and the resolution of infection. Classically activated macrophages are fungistatic against cryptococci and are likely to be important for controlling infection during pulmonary cryptococcosis. Our model suggests that classical macrophage activation is mediated via IFN-γR signaling through STAT1, and that termination of the signaling via SOCS1 and SOCS3 may be critical for curtailing host inflammatory responses and preventing damage to the lungs. Taken together, these results indicate that therapies targeting the induction of classical macrophage activation have the potential to augment protection against pulmonary cryptococcosis and other opportunistic pathogens in the lungs. We thank Drs. Garry Cole, Jose Lopez-Ribot, and Judy Teale for critical reading of the manuscript. This work was supported by National Institutes of Health/National Institute of Allergy and Infectious Diseases Grant RO1 AI071752 (to F.L.W.). The content of this article is solely the responsibility of the authors and does not necessarily represent the official views of the National Institute of Allergy and Infectious Diseases, the National Institutes of Health, or The University of Texas at San Antonio. The real-time PCR array results presented in this article have been submitted to the National Center for Biotechnology Information's Gene Expression Omnibus (http://www.ncbi.nlm.nih.gov/geo/) under accession number GSE39990. Copyright © 2012 by The American Association of Immunologists, Inc. Freely available online through The Journal of Immunology Author Choice option.
. 2009. Estimation of the current global burden of cryptococcal meningitis among persons living with HIV/AIDS. AIDS 23: 525–530.
. 1995. Cryptococcosis in the era of AIDS: 100 years after the discovery of Cryptococcus neoformans. Clin. Microbiol. Rev. 8: 515–548.
. 2009. Alternative activation of macrophages: an immunologic functional perspective. Annu. Rev. Immunol. 27: 451–483.
. 2008. Exploring the full spectrum of macrophage activation. Nat. Rev. Immunol. 8: 958–969.
. 1989. Fungicidal activity of IFN-γ-activated macrophages: extracellular killing of Cryptococcus neoformans. J. Immunol. 142: 3219–3224. 2010. Pulmonary infection with an interferon-gamma-producing Cryptococcus neoformans strain results in classical macrophage activation and protection. Am. J. Pathol. 176: 774–785.
. 2009. Robust Th1 and Th17 immunity supports pulmonary clearance but cannot prevent systemic dissemination of highly virulent Cryptococcus neoformans H99. Am. J. Pathol. 175: 2489–2500.
. 2005. Role of IFN-γ in regulating T2 immunity and the development of alternatively activated macrophages during allergic bronchopulmonary mycosis. J. Immunol. 174: 6346–6356.
. 2007. IL-13 induces disease-promoting type 2 cytokines, alternatively activated macrophages and allergic inflammation during pulmonary infection of mice with Cryptococcus neoformans. J. Immunol. 179: 5367–5377. 2010. Interleukin-17 is not required for classical macrophage activation in a pulmonary mouse model of Cryptococcus neoformans infection. Infect. Immun. 78: 5341–5351.
. 2007. Protection against cryptococcosis by using a murine γ interferon-producing Cryptococcus neoformans strain. Infect. Immun. 75: 1453–1462.
. 2009. Insights into the mechanisms of protective immunity against Cryptococcus neoformans infection using a mouse model of pulmonary cryptococcosis. PLoS ONE 4: e6854.
. 2011. Effect of cytokine interplay on macrophage polarization during chronic pulmonary infection with Cryptococcus neoformans. Infect. Immun. 79: 1915–1926.
. 1999. SOCS1 is a critical inhibitor of interferon γ signaling and prevents the potentially fatal neonatal actions of this cytokine. Cell 98: 597–608.
. 2001. Neutralization of interferon-γ in neonatal SOCS1−/− mice prevents fatty degeneration of the liver but not subsequent fatal inflammatory disease. Immunology 104: 92–98.
. 1999. Mutational analyses of the SOCS proteins suggest a dual domain requirement but distinct mechanisms for inhibition of LIF and IL-6 signal transduction. EMBO J. 18: 375–385. 2005. Mechanisms of type-I- and type-II-interferon-mediated signalling. Nat. Rev. Immunol. 5: 375–386.
. 2001. A macrophage protein, Ym1, transiently expressed during inflammation is a novel mammalian lectin. J. Biol. Chem. 276: 17497–17506.
. 2000. Biochemical characterization of endogenously formed eosinophilic crystals in the lungs of mice. J. Biol. Chem. 275: 8032–8037.
. 2000. Alternatively activated macrophages induced by nematode infection inhibit proliferation via cell-to-cell contact. Eur. J. Immunol. 30: 2669–2678.
. 2002. Differential expression of FIZZ1 and Ym1 in alternatively versus classically activated macrophages. J. Leukoc. Biol. 71: 597–602.
. 2002. TH2 cytokines and allergic challenge induce Ym1 expression in macrophages by a STAT6-dependent mechanism. J. Biol. Chem. 277: 42821–42829.
. 2001. Divergent roles for macrophages in lymphatic filariasis. Parasite Immunol. 23: 345–352.
. 1999. Alternative versus classical activation of macrophages. Pathobiology 67: 222–226. 2003. Alternative activation of macrophages. Nat. Rev. Immunol. 3: 23–35.
. 1992. Interleukin 4 potently enhances murine macrophage mannose receptor activity: a marker of alternative immunologic macrophage activation. J. Exp. Med. 176: 287–292.
. 2002. Reactive oxygen species and cell signaling: respiratory burst in macrophage signaling. Am. J. Respir. Crit. Care Med. 166: S4–S8.
. 2001. Differential regulation of nitric oxide synthase-2 and arginase-1 by type 1/type 2 cytokines in vivo: granulomatous pathology is shaped by the pattern of l-arginine metabolism. J. Immunol. 167: 6533–6544.
. 2001. Lung surfactant and reactive oxygen-nitrogen species: antimicrobial activity and host-pathogen interactions. Am. J. Physiol. Lung Cell. Mol. Physiol. 281: L517–L523.
. 2002. Killing of Klebsiella pneumoniae by human alveolar macrophages. Am. J. Physiol. Lung Cell. Mol. Physiol. 282: L944–L956.
. 2009. Cytokine signaling regulates the outcome of intracellular macrophage parasitism by Cryptococcus neoformans. Infect. Immun. 77: 3450–3457.
. 1994. Jak-STAT pathways and transcriptional activation in response to IFNs and other extracellular signaling proteins. Science 264: 1415–1421.
. 2003. The transcriptional coactivator CREB-binding protein cooperates with STAT1 and NF-κB for synergistic transcriptional activation of the CXC ligand 9/monokine induced by interferon-γ gene. J. Biol. Chem. 278: 651–660.
. 2010. Dipyrithione inhibits IFN-γ-induced JAK/STAT1 signaling pathway activation and IP-10/CXCL10 expression in RAW264.7 cells. Inflamm. Res. 59: 809–816.
. 2002. Antibody-mediated protection in murine Cryptococcus neoformans infection is associated with pleotrophic effects on cytokine and leukocyte responses. Infect. Immun. 70: 1571–1580.
. 2005. Antibody-mediated protection against Cryptococcus neoformans pulmonary infection is dependent on B cells. Infect. Immun. 73: 1141–1150.
. 2005. The γ interferon receptor is required for the protective pulmonary inflammatory response to Cryptococcus neoformans. Infect. Immun. 73: 1788–1796.